One look at the head-note will show that there�s an unusually broad compositional breadth to this conspicuously successful disc. 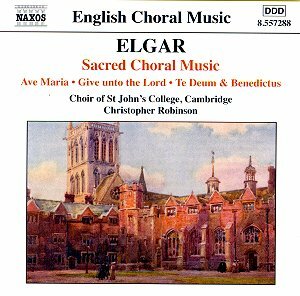 It reaches back to Elgar�s Op.2, the three anthems he wrote after having succeeded his father as organist at St George�s Worcester, and as far forward as the 1914 Psalm setting Give Unto the Lord. That later setting brims with power and confidence but has a characteristically meditative central panel as well that reflects, with perfect simplicity, Elgar�s sense of contrast, colour and drama. The early anthems demonstrate his melodic gift heightened by a kind of innocent delicacy and in two of the settings real beauty of utterance. The Ave Maria is particularly fine and in this performance the tonal blend of the choir succeeds in heightening its beauty of expression. If anything Ave maris stella is just as fine, maybe even finer, with the solo voice imbued with a touching refinement. Whether in Latin or in English, whether for contemplative or for grand state occasions, Elgar�s technical control, and his command of emotive potential, remains paramount. Thus O hearken Thou, a setting written for George V�s coronation in 1911 is very much, as the Abbey organist of the time Sir Frederick Bridge put it, full of "reverent supplication." But it�s Great is the Lord that more certainly catches the ear. Written the following year this ten-minute setting of Psalm XLVIII is an anthem scored for six-part choir and bass solo (well taken here). It has an effective (and indeed quixotically) quicksilver quality, with harmonic richness, jaunty freedom and maestoso swagger all held in apposite balance. The 1897 Te deum laudamus shows Elgar�s accustomed confidence in his handling of material � it�s also the piece that comes nearest Imperial jaw jutting � and one of the pleasures of the disc, aside from the strong musical virtues of the performances, is to be aware of musical juxtapositions such as this piece and, say, the moving compression of the 1909 Go Song of Mine. This was a Dante Gabriel Rossetti translation of a poem by Guido Cavalcanti written during the Elgars� stay in Italy. The more familiar pieces from The Apostles and The Light of Life emerge, in this context, entirely appositely. Christopher Robinson has impressed before on disc with Elgar and he does so here, in spades. The choral performance is exemplary, the acoustic unproblematic, and the direction at all times centred on the real musical virtues of this immaculately chosen selection.